A manufactured home floor plan is an invaluable tool for potential home buyers. In the US alone, there are dozens of manufactured home builders offering hundreds of different models. Using information provided on the model’s floor plan can help buyers determine the best home for their needs quickly and easily. 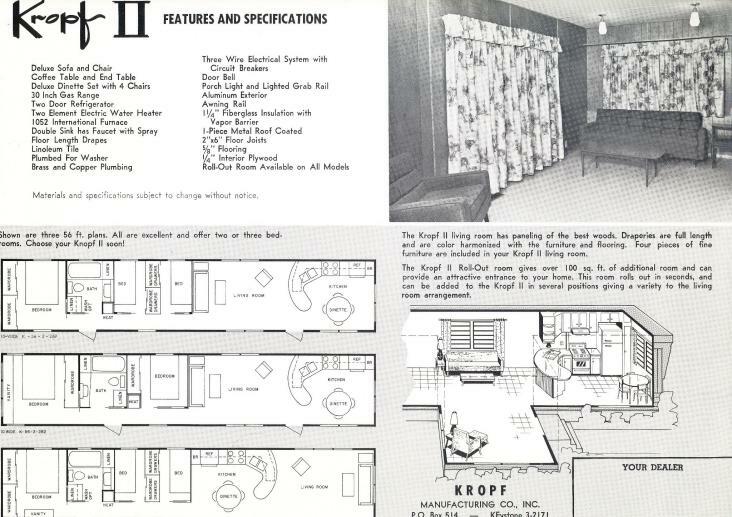 …the floor plan is a treasure map, written in a symbolic language and promising the fulfillment of a dream. There are two basic manufactured home categories: the single section and the multi-section. Single wides and park model homes are classified as single section homes. They come out of the factory completely enclosed and intact on a single chassis. Double wides and triple wides are considered multi-section homes. A double wide is basically two single sections, each on their own chassis, and are joined together on the lot. A double wide has two independent chassis that are finished on three sides and attached together. Triple wides have three separate chassis that are combined together. 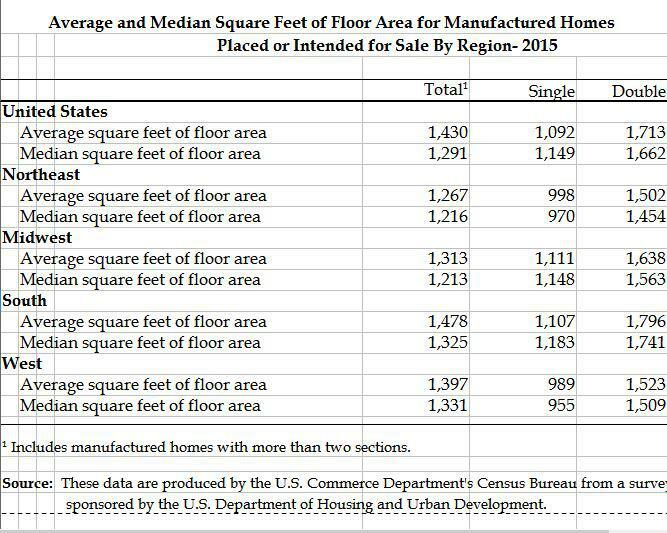 In 2015, the average manufactured home size was 1,430 square feet. The average price of $68,000. The sizes available for each chassis is limited to ‘wide load’ highway restrictions but that shouldn’t restrict buyer’s options much. 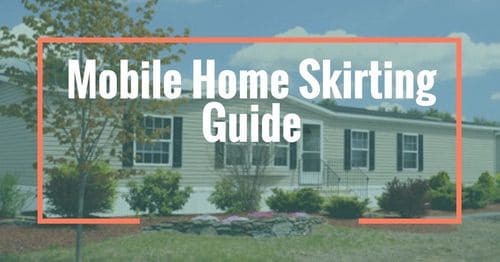 A single section manufactured homes are available in lengths up to 80′ and widths up to 18′ in most states (a few states do not allow the larger sizes to be transported on their highways). The most popular single wides in 2015 are between 1,092 – 1,216 square feet with dimensions around 16′ wide and 76′ long. Source. Buyers like double wides in the 1600-2400 square foot range. The most popular model, 28′ wide by 60′ long, provides 1680 square feet. A manufactured home floor plan tells us so much about a home! It’s basically a map showing the most important details of a home’s layout. Information about placement, dimensions, features, and construction notes are usually conveyed on a manufactured home floor plan. Palm Harbor’s Vista Ridge model is represented well with the floor plan and an image of the completed home. The two images reveal a ton of information about the home. A floor plan is a scaled diagram of a room or building viewed from above. The floor plan may depict an entire building, one floor of a building, or a single room. It may also include measurements, furniture, appliances, or anything else necessary to the purpose of the plan..
A virtual tour allows potential buyers the personal experience of walking through the home without actually needing to visit the lot. 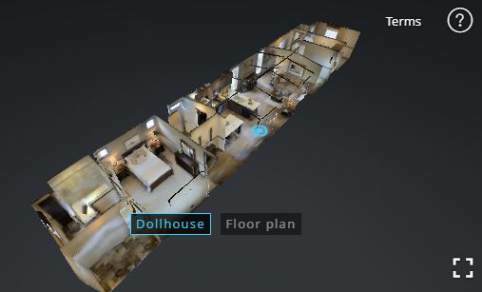 Many manufactured home builders are now offering buyers a more detailed experience via computerized 3D (three-dimensional) floor plans and virtual tours. 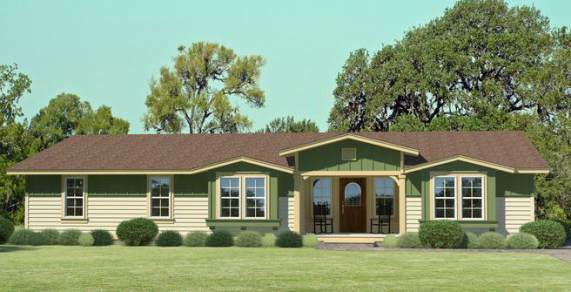 Click here to experience Cavalier Home’s Oaklawn Model via virtual 3D manufactured home floor plan. What Makes a Good Manufactured Home Floor Plan? A well-designed manufactured home meets the needs of the family. It has good flow between the rooms and the furniture within the rooms. Rooms are properly proportioned. Windows allow ample sunlight. 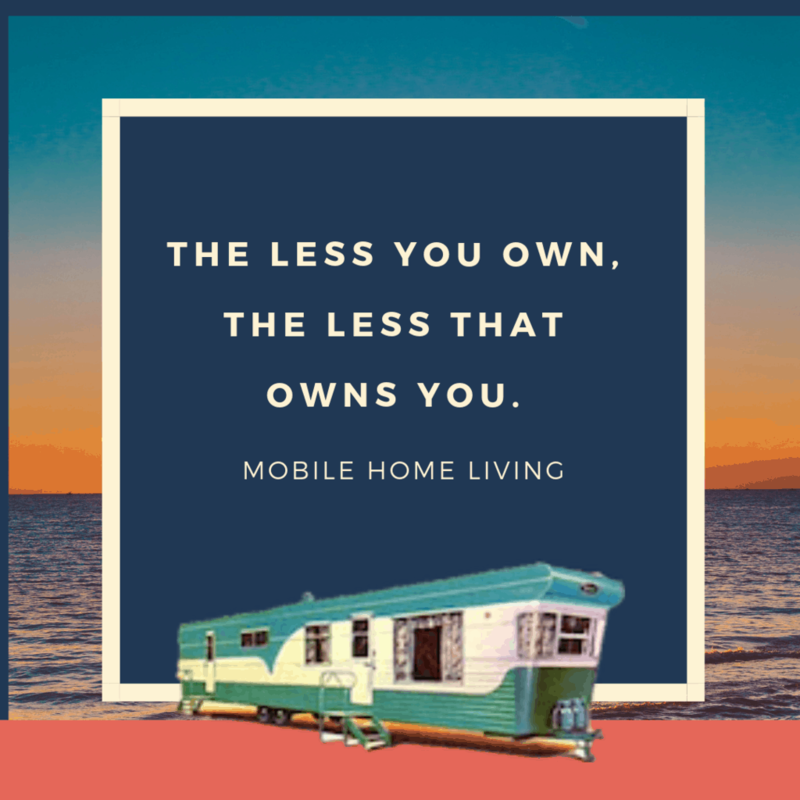 A good manufactured home floor plan is the same as a good site-built home floor plan – it works for the family and provides them space to live effortlessly. 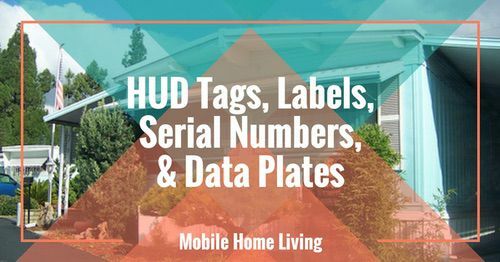 Manufactured home floor plans show shape, dimensions, room sizes, built-in placements, and layout of the home. 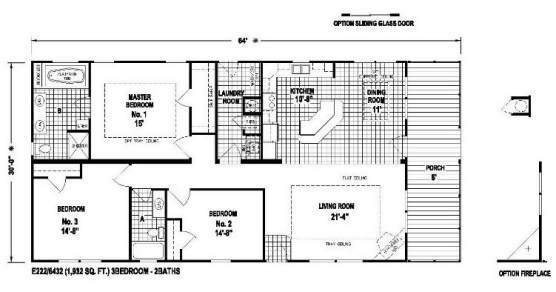 In short, a floor plan is a two-dimensional drawing or map of the home. As with maps, a manufactured home floor plan uses a legend. A legend is a list of the symbols used on the manufactured home floor plan to convey detailed information such as scale, walls, windows, doors, bathtubs, counters, and appliances. Source:Get a list of regularly used floor plan symbols here. 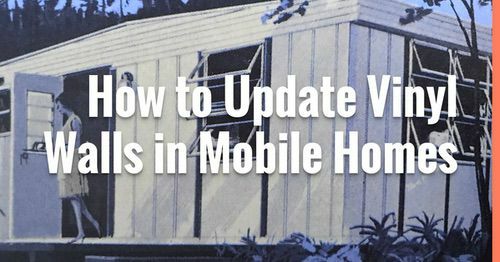 Learn how to calculate the actual size of a manufactured home using scale information. The elevation of a manufactured home may not be a part of the floor plan but it is usually attached to it. ‘Elevation’ helps buyers envision the home after installation. The image above from Palm Harbor Homes is a good example of an elevation image. Walls, windows, and doors are portrayed in a manufactured home floor plan using particular lines, symbols, and patterns. 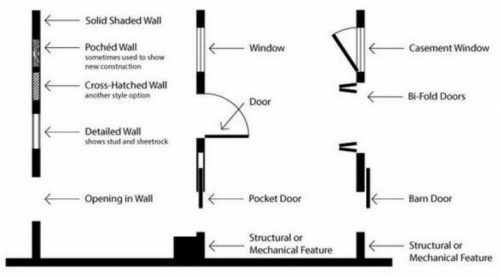 The image below is just a small sample of the many symbols used in a typical floor plan. Click here to see a detailed list of symbols. 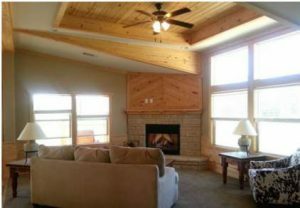 Manufactured home floor plans typically only show outside features such as porches or decks if they are built onto the chassis. 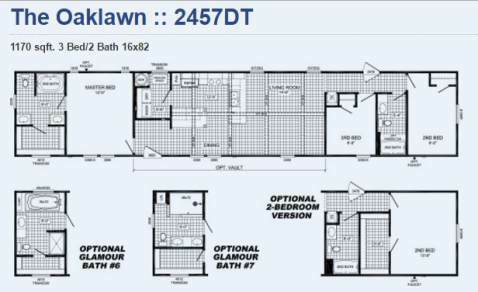 In the manufactured home floor plan below you can see the porch on the top middle of the page. Click here to see a complete list of abbreviations used in modern floor plans. 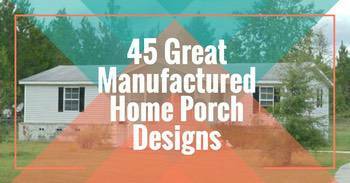 Manufactured housing has started many new trends in home design and construction. Dozens of architects, designers, and builders competing against each other to offer buyers better choices. 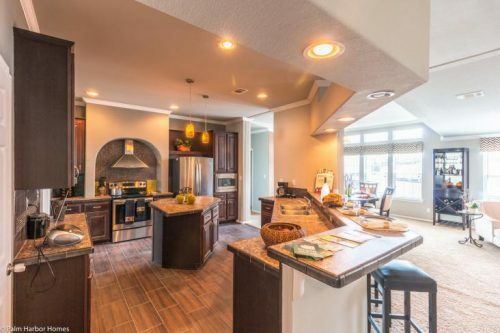 An open floor plan, called a free plan, has been popular with buyers for a few years now. In both single wides and multi-sectional homes, it is popular to place the shared living spaces (living room and kitchen) together. Only a breakfast bar or half wall typically separate the two spaces. Open floor living still provides ample privacy in the bathing and sleeping quarters. Reduced building costs and better lighting are two great reasons to chose an open floor plan. 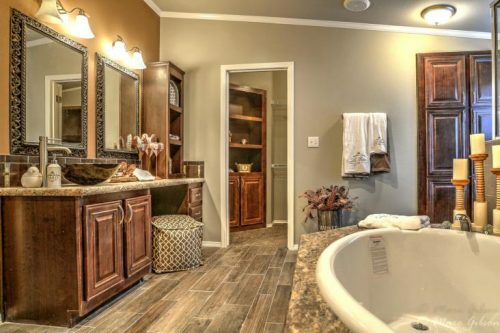 A master suite is when a full bathroom and a (typically walk-in) close are built into a master bedroom. Mother-in-law setups separate the master bedroom from the other sleeping quarters, oftentimes on the other end of the home. This provides parental privacy, a valuable thing to have in a larger family. There’s only so many designs available in a rectangle. Putting the kitchen on the end of a mobile home first appeared in the 1950’s. The mid-kitchen design eventually became the most desired home design but we’re seeing end kitchens make a comeback. Having an end kitchen allows the space to have windows and doors on three walls instead of two. More windows allow more sunlight and help create a sense of spaciousness. 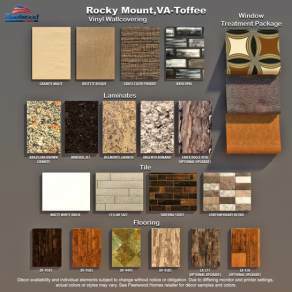 Another popular manufactured home floor plan option is integrated outdoor spaces. Adding a covered porch onto a manufactured home’s chassis makes outdoor living spaces attainable on smaller lots. The Skyline Home below has a fairly large integrated outdoor space on one end. The SkyRanch “The Kerr” Manufactured Home has 1932 square feet of living space, both indoors and outdoors. Being environmentally friendly is a popular motivation for manufactured home buyers. They want a small energy footprint while still living large. Luckily, that’s absolutely possible. Energy Star certified manufactured homes are available from the majority of builders. Walk-in storage is another popular manufactured home design trend. Buyers want organized walk-in pantries and closets throughout the home. Which Manufactured Home Floor Plan is Right for You? 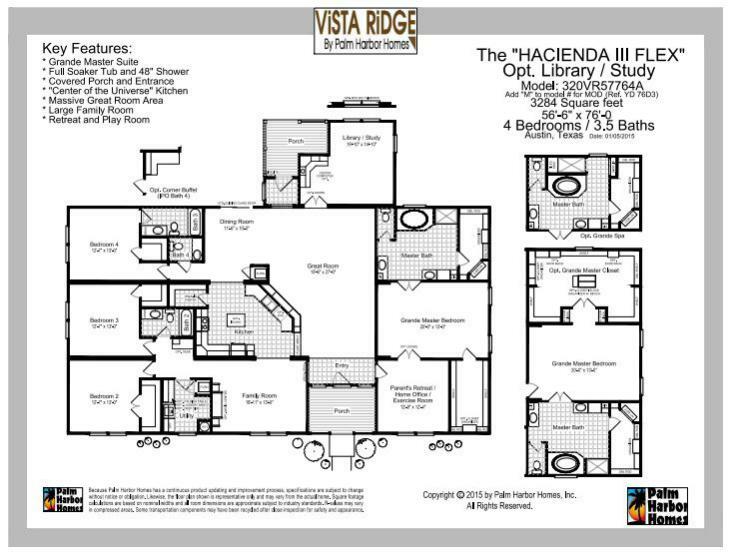 Buyers will need to take a close look at lifestyle, health, and future family needs when choosing the best floor plan. A smart floor plan allows family members to flow from one room to the other easily and maximizes space. Does your family congregate in the kitchen or the living room most? Do you have a need for a formal dining room? 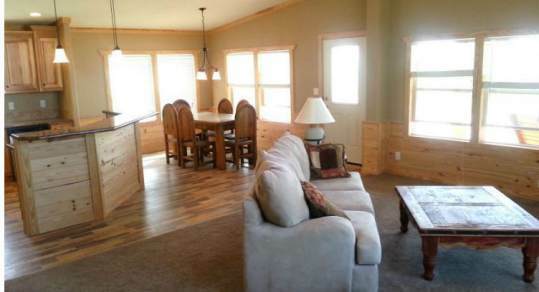 Do you want a single living room or a living room and separate family room or den? Do you need an extra bedroom? An office or workshop? What are your favorite activities or hobbies when you’re at home? What type of space is needed? Do you or anyone in your family have mobility or health issues? Is an outdoor living space, or covered porch, important enough to you that you are willing to lose interior living space? Are built-ins something you want? Would you rather use furniture in the home? Will your furniture fit in the new home? If not, are you willing to buy new furniture? The shape and layout of the land are more important than you may realize. Mature trees, walkways, garages, and utility restrictions will need to be considered. Think about the views from each room. Which room takes advantage of that view best? Sun and shade are important factors to consider as well. Does the layout of the home allow the sunlight to help heat the home in the winter? Is there shade to help cool the home in the summer? 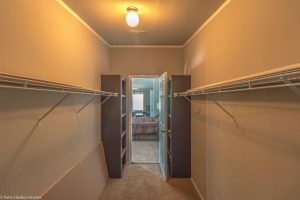 If you’re young family or there’s a chance that an elderly parent will need to move into your home you may want to consider an extra bedroom. Building an addition onto a manufactured home is expensive! 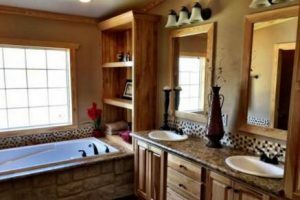 Most manufactured home builders offer upgrades and customizations though to what extent depends on the model. The decor is easily changed in a manufactured home. Wall decor, flooring, cabinetry, countertops, and backsplashes are often changed by buyers when ordering a new home. 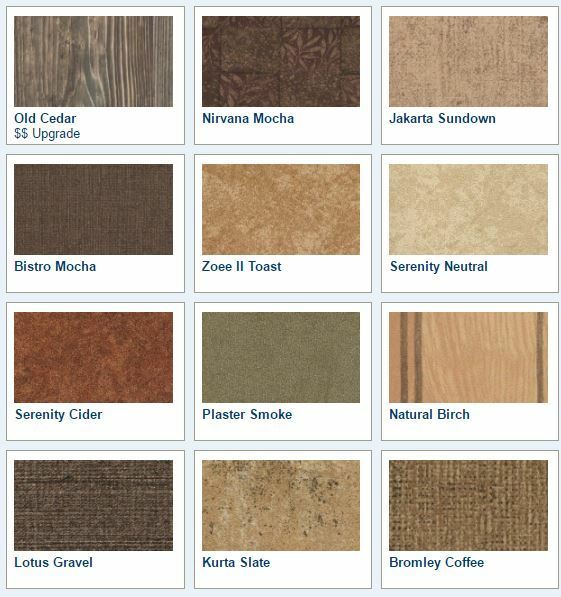 Fleetwood Homes include different decor design boards with their floor plans to help buyers choose the surface material and color (above left). Cavalier Homes offers buyers an online design center that gives them multiple choices for paint, flooring, drapes, and wallboard (above right). Flipping a manufactured home floor is often done to maximize views. 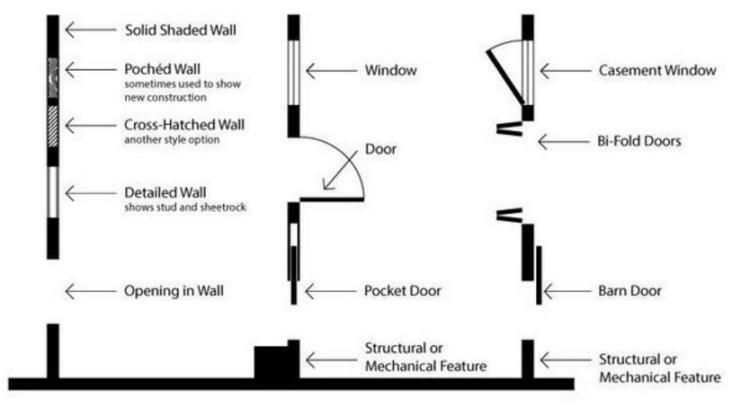 Buyers can increase room sizes by moving walls if architectural schematics allow it. Floor plans are a great tool to choose the right manufactured home. 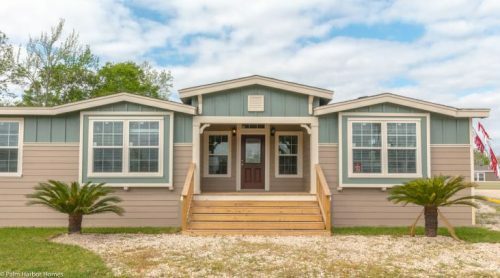 Now that you understand more about manufactured home floor plans you should be able to find the model that best suits you and your family. Best of luck! 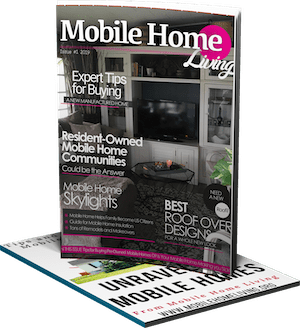 Our article titles Smart Upgrades for your New Manufactured Home will give you some tips. 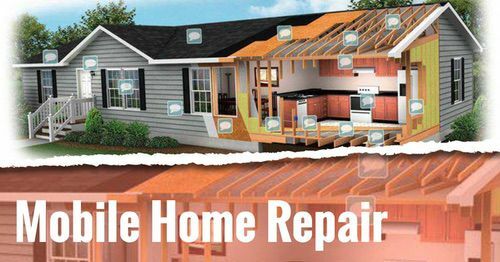 ideally, you want to focus on the structure: roofing, framing, windows and doors, siding, and sub-flooring. Unfortunately, there’s no real way to find the blue prints. You likely won’t find any information other than what’s been posted by an owner – the companies do not usually have any information for previous models available. There’s just too many models and builders.